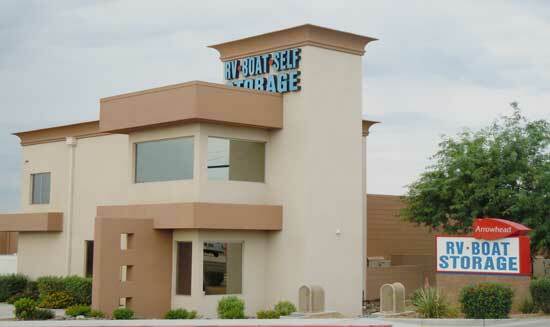 Arrowhead RV & Boat Storage is conveniently located on Peoria Avenue near the Loop 101 Freeway. Arrowhead RV & Boat Storage is easily reached from anywhere in the Phoenix Metropolitan area, and currently serves customers from Peoria, Phoenix, Tempe, Sun City, Surprise & other parts of the Valley. Secure your RV, boat, trailer or other personal valuables in a storage facility recognized as one of the best choices for Phoenix area recreational vehicle, boat and truck storage. We offer a variety of sizes and styles of enclosed garages, covered & uncovered parking as well as convenient mini storage / self storage facilities. Let us store your investment in safe location with opportunities for both traditional outdoor and state-of-the-art indoor storage. We offer on-site management with convenient office hours & 24/7 gate access. Uncovered, covered & enclosed garage parking spaces. All driveways & storage spaces are fully paved. Enclosed mini storage units available.